Late one evening last summer, I was coming home from a night out with my parents. 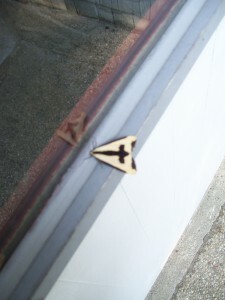 As I approached the house, I noticed a moth with unusual markings on its wings perched on my door. It was dark out, but even by the dim patio light I could see that the design resembled that of a cross. I walked into the house, tired, thinking that I should get a picture of it, but then I got distracted, forgot all about it, and went to bed. The next morning, I let the dogs out and remembered the moth on the front door. I checked and was shocked to find that it was still there. I went back inside, grabbed my camera, snapped a few shots, then downloaded them to see how they looked. I was not at all happy with the close-ups – – they were all blurry. The clearest photo was the one posted above. So I went back outside to get a better picture. Why was it there all night, and then suddenly gone once I took the picture? I was sitting on my front porch and when I walked in the door, my daughter said, Mom!!!! There’s something in your hair!!! And it was one of those moths!! 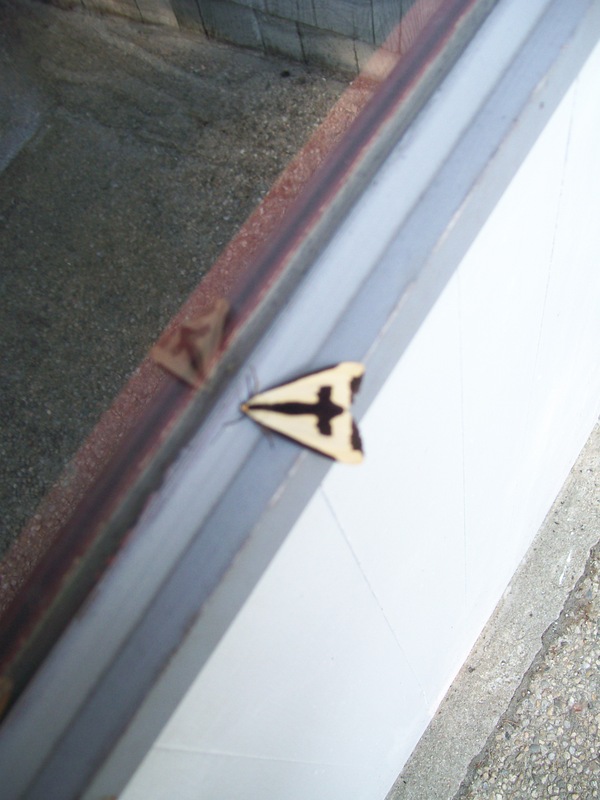 We called it the Jesus moth, and it’s so amazing cause we’ve had so many signs from God lately and this is another one! God is amazing!!! Wow! Just saw one a few days ago, on my counter in the kitchen, I also had been praying hard for someone in trouble and i have been so worried about him. I knew when i took the pic of it my prayers had been answered! God is so good to me! I had one arrive last August .it died three days after. Arriving. I have it in a shadow box. This evening when my husband went out on the deck he noticed another one on the side. By the doors. The first one appeared when we were going thru a major change and here we are again. Change is good , was the last time and will be this time as well. Blessings. To you all. I found one yesterday on my front door. Beautiful! Nature itself praises God! I live in hoggansville ga , 4.5 years ago i started preaching after 17 years in a bottle i finally answerd GOD’S calling. amonth later found one of.these moths .i have been praying hard lately sense i just had knee surgery wed, and last night found another, this morning its still here. the LORD will send you reasurance in a way some would say is coincedence, but being a CHRISTIAN I don’t believe in them GO BLESS US ALL PLEASE ECCEPT CHRIST TODAY AS YOUR SAVIOUR, rev. gene kirklin. I found this beautiful moth today I also have been praying more intensely recently! The moment I saw it, I knew it was a sign from God! I can’t stop looking at it, thinking about it! I feel the blessing! son to take a picture bc where it landed I couldn’t see it. to show me if He wanted me to do what He has asked me to do. and I know again that my prayers have been answered once again. to have one of these moths. God bless!!! Wow! SO cool! Thanks for stopping by! wow… that was cool! enjoying your website very much. Happy to hear it! Come again!